Access Your Account Online and Sign Up for Email Billing! 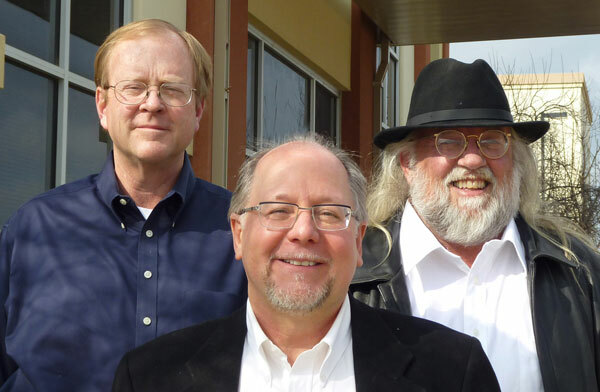 Eldorado Natural Spring Water uses a Third Party payment processing portal. Please click the button below to safely pay your bill online with Credit Card or Electronic Check. SERVICE PLAN TERM. Subject to the terms and conditions set forth in this Agreement, Lessor hereby leases to Lessee Equipment for a term of 1 year (13 statement periods). If thereafter, Lessee remains in possession of the Equipment with the consent of Lessor, this agreement shall continue on a month to month basis, Lessor shall be notified in writing of any changes to terms and conditions. Except for termination of this agreement pursuant to the provisions of paragraph no. 4 of this agreement, this agreement may be terminated prior to the expiration of its term by either party, by giving 30 days prior written notice of intent to terminate this agreement, provided further, that Lessee shall be subject to a $50.00 break lease fee in the event that Lessee terminates this agreement prior to the expiration of its term. SERVICE PLAN. Lessee shall pay to Lessor rent for the use of the Equipment and for units delivered every delivery cycle, payable on the first day of each month. There will be a charge per unit for additional product. LATE FEE. In the event any payment required hereunder is not made within 30 days after the payment is due, interest on said arrears at the rate of 18% per annum from the date of default in payment until such arrears shall have been paid shall be paid by Lessee to Lessor. Such interest fee shall be deemed Additional Rent. No partial payment by Lessee, or acceptance by Lessor shall cure any outstanding default, stop the Lessor from pursuing, or continuing to pursue, remedies for such default, or act as a waiver. OWNERSHIP AND USE. The Equipment shall at all times be the sole and exclusive property of the Lessor. The Lessee shall have no rights or property interest in the Equipment, except the right to use the Equipment at the address set forth above. Lessee shall not remove or relocate the Equipment without the written consent of Lessor. Lessee shall indemnify Lessor for any liability resulting from the use of the Equipment. MAINTENANCE AND DAMAGE. Lessor shall keep the Equipment in good working order. Lessee shall be responsible for loss or damage to the Equipment from any cause, reasonable wear and tear excepted. This includes the equipment listed above as well as bottles loaned to the customer. Lessor will be charged $6.00 for any unreturned or damaged bottles upon termination or if periodic review reveals your account is out of balance. DEFAULT. If Lessee shall be in arrears in the payment of any installment of the Service Plan, any Additional Rent, or any portion thereof, or in default in payment for water delivery charges, or in default of any other covenants or agreements set forth in this Agreement ('Default'), and the Default remains uncorrected for a period of three (3) days, at the Lessor's option, Lessor may undertake any of the following remedies without limitation: (a) declare the Term of the Agreement ended; (b) recover all present and future damages, costs and other relief to which the Lessor is entitled: (c) purse all breach of contract remedies; (d) pursue an action in Conversion against Lessee for full value of the Equipment, rent due, costs, attorney's fees, and punitive damages in the amount of the value of the equipment, (e) proceed under C.R.S. 18-4-405 for recovery of property, plus costs, attorney's fees, and treble damages equaling three times Lessor's actual damages; (f) enter the Lessee's premises, or any premises that the Equipment may be found, forcibly, if necessary, and repossess the Equipment; (Lessee hereby expressly waives any claim or right of action for trespass or damages caused by any such entry and repossession); or (g) pursue any and all available remedies in law or equity. In the event Lessor repossess the equipment by reason of Default prior to expiration of the Term of Agreement, Lessee shall be responsible for the Rent and Additional Rent occurring for the remainder of the Term, subject to Lessor's duty to mitigate damages. Additionally, failure to return the Equipment may subject Lessee to a fine, imprisonment, or both, pursuant to C.R.S. 18-4-402 (Theft of Rental Property). ATTORNEY'S FEES. In the event any dispute arises concerning the terms of this Lease, or the non-payment of any sums under this Agreement, and the matter is turned over to any attorney, the party prevailing in such dispute shall be entitled, in addition to other damages and costs, to recover reasonable attorney's fees from the other party. AUTHORIZATION FOR CREDIT CARD CHARGE. In the case of loss, damage or failure to return Equipment after the termination of this Agreement, or failure to pay rental or water charges, Lessee expressly authorizes the credit card company noted above to pay any and all such charges for Equipment, rent, or water charges to Lessor. While this section is to make doing business with us as convenient as possible, please don't hesitate to call or contact us directly at any time. 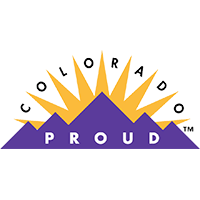 From the bottom of our hearts, we thank you for choosing Eldorado. We know you have lots of choices, and we're grateful that you've chosen our fresh, spring artesian water. Many of our new customers come to us as referrals from our existing customers. 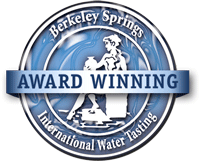 This makes sense given the purity and taste of Eldorado Natural Spring Water, as well our commitment to fantastic customer service. If you would like to share the benefit of receiving Eldorado Natural Spring Water with a friend, we would like to reward you with 1 month of free service plan credit on your bill. What do I do and how does it work? 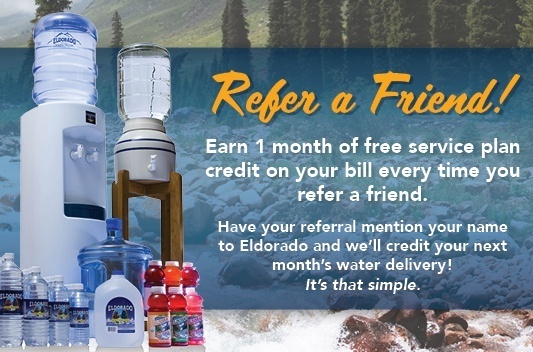 To receive the credit, all you have to do is have your referral mention your name to Eldorado and we'll credit your next month's water delivery! It's that simple.